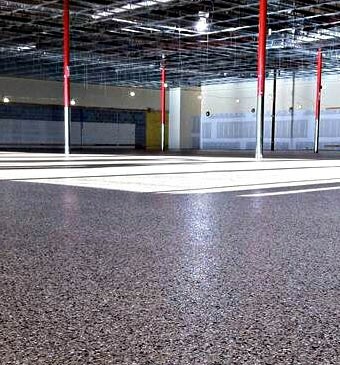 Bomanite Broadcast Flake floors are multi-colored flakes encapsulated in high performance, two-component primer, body and top coats. This architectural and protective flooring system utilizes Bomanite Florspartic 100 to create a highly durable, low maintenance surface and provides superior chemical resistance including gasoline, oil and de-icing salts. This zero VOC fast track flooring system can be applied over prepared concrete and suitable cementitious toppings to form a seamless surface ideal for residential and light commercial applications such as garage floors, basements, indoor recreational facilities, schools and light manufacturing. 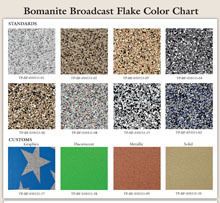 Various graphic designs or patterns may be incorporated into a Bomanite Broadcast Flake System. Standard flake color blends are available in 1/4″ and 1/8” sizing’s as well as additional sizes upon request in 1/16”, 3/8” and 5/8”. Custom flakes such as metallic and fluorescent shades, glow in the dark and silver sparkle are provide an unlimited creativity. Consult with your local Bomanite Licensed Toppings installer for additional information on custom flakes and unique projects.